Wholesale Trader of a wide range of products which include warning safety signs, informatory safety signs, electrical safety signs, chemical safety signs, school safety signs and conservation safety signs. We are known for creating a wide range of innovative and sustainable products for the industrial markets among which Warning Sign stands on its design, strength and reliability. 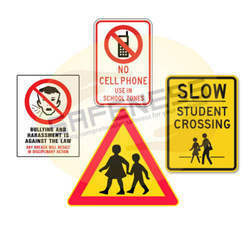 The offered safety signs are designed by our adept professionals using high grade basic material and modern technology. 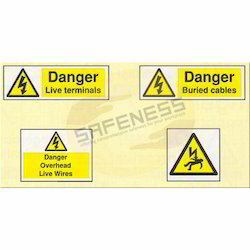 Our provided safety signs are available in variegated specifications and sizes as per the demands of our valuable clients. 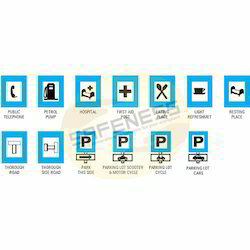 Apart from this, clients can avail these safety signs from us at nominal prices. This Danger Sign is also recommended for labours, workers and inspection officers to use while performing their duties at the site. These Caution Sign are finely finished and are known for their ability to provide optimal protection. We have over two decades of vast industrial knowledge and experience in producing superior quality Public Place Sign. Wherever you need to inform people regarding anything at the workplace or it could be any place of public movement, residential activity area, these signs play an important role. These signs are silent speakers to the humans. They also used to give advance information about destination or distance on the roads or identify points of interest along the way. Our range of size and material ensure the availability of right option suitable for your place/workplace at all times. Our engineers and the technical team also provide customised designs Work Place Safety Sign as per customer requirements and applications. The basic materials used in manufacturing Informatory Sign are well tested by our testing team to ensure its safety. 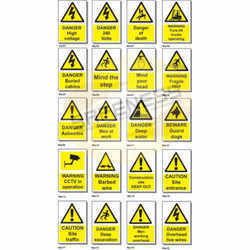 We are long-time established manufacturer, distributor, importer and exporter of Caution Sign. These signs are used to caution / warn people on potential dangers at electrical area / site, and to take care of human safety. They are majorly used to warn regarding the voltage, overhead power lines / cables etc. Our range of size and material ensure the availability of right option suitable for your place / workplace at all times. Our Danger Sign are being exported to global regions like of Middle East, Africa, South Asia, Latin America, Europe, Bangladesh, Bhutan, Nepal, Sri Lanka and many more. Electrical Hazard Sign provides adequate protection to a person working in adverse working conditions. We are one of the prominent names in the industry, offering Caution Sign. These signs are used to caution / warn people on potential dangers from chemicals at chemical laboratories, research laboratories, chemical industries, chemical manufacturing sites etc. It takes care of human safety. They are majorly used to warn on chemical flammability / combustibility, type of chemical etc. They are also used to inform the name of chemicals in the area, safety measures to be taken etc. Our range of size and material ensure the availability of right option suitable for your place / workplace at all times. We offer broad selection of Industrial Safety Sign for construction, chemical, food service, metal, cement , marine and other industries. We study the market demand for Warning Sign regularly and keep optimum stock levels. With more than two decades of experience in the field of Industrial Safety Products, we have emerged as a respectable leader for the supply of School Traffic Sign. These signs are used to caution / warn people driving around school areas to take care of kids safety. It mainly safeguards young kids in school areas. It is also used to maintain school property and systemize activities inside the school. Our range of size and material ensure the availability of right option suitable for your place / workplace at all times. Our product Bully Free Zone Sign was developed keeping in mind the safety of people working in manufacturing plants and indoor or outdoor work sites. This Traffic Safety Sign conforms to government standards and industry regulations. New models of this School Safety Sign keep developing to produce higher quality products without cutting corner. We offer extensive and comprehensive range of Recycle Signs. This Go Green Sign is used in work areas which are prone to higher risk of accidents. These signs are used to educate people on environmental conservation. They are mainly used to ask people to save resources, manage waste, inform regarding recycled items and dispose them in right way. Our range of size and material ensure the availability of right option suitable for your place / workplace at all times. The product Conservation Labels is designed keeping in mind all innovative approaches to workforce safety and demands, made by industries worldwide. 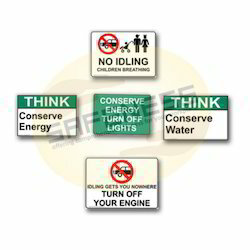 We are the prominent manufacturer, supplier, trader, distributor and exporter of Transport Safety Sign. These signs are used to indicate potential dangers that may occur due to improper handling of a different kind of material. They are mainly used to take care of important products during transport or storage. Our range of size and material ensure the availability of right option suitable for your place/workplace at all times. This Packing Sign allows the workers to handle hazardous tasks in the workplace with adequate safety. Fragile Material Safety Sign finds its application in industries like Power, Energy, Railways, Automobiles, Aviation, Engineering and Construction. Our product is well known for its convenience to use, high strength, lightweight and high durability. 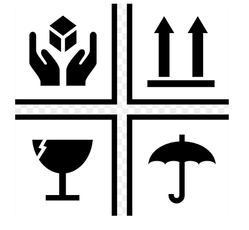 These signs are used to protect humans from health hazards at industrial areas or any public places. They are mainly used to give descriptive instructions and warnings regarding health hazards. It contains Danger, Warning or Cautions sign at the top of the signboard. Our range of size and material ensure the availability of right option suitable for your place/workplace at all times. 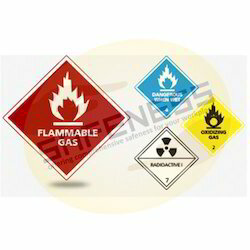 Industrial Hazard Sign is available in customised styles and colours as per customer’s demand. Our quality management team inspects and tests Warning Sign before it is dispatched to customers. Danger scaffolding incomplete hanging signs indicate the areas which are at potential risk due to unfinished scaffolding. 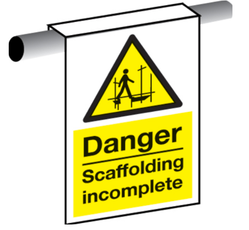 Hanging scaffold signs feature a curved top edge that easily hooks onto the scaffolding. Danger scaffolding incomplete sign resists ageing, physical damage and weathering, and is easy to clean. 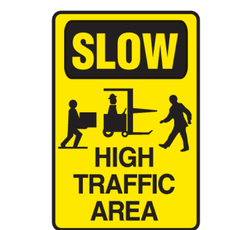 Slow high traffic area sign is displayed on high traffic areas in a plant to ask the individuals to move slow. In a plant, traffic signs alert the workers to the dangers of moving vehicles. Heavy gauge non-reflective polyethene mounts to walls, doors or beams. 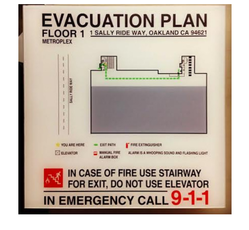 Install signs in your plant to prevent injuries or property damage. 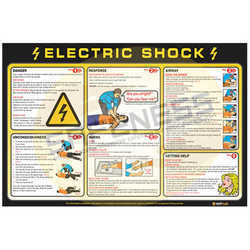 We have over two decades of vast industrial knowledge and experience in producing superior quality First Aid Posters. The basic materials used in manufacturing First Aid Wall Charts are well tested by our testing team to ensure its safety. 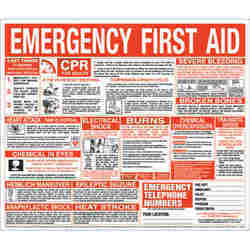 We are long-time established manufacturer, distributor, importer and exporter of First Aid Chart. 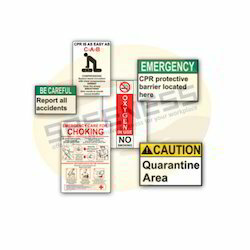 Looking for Safety Signages ?